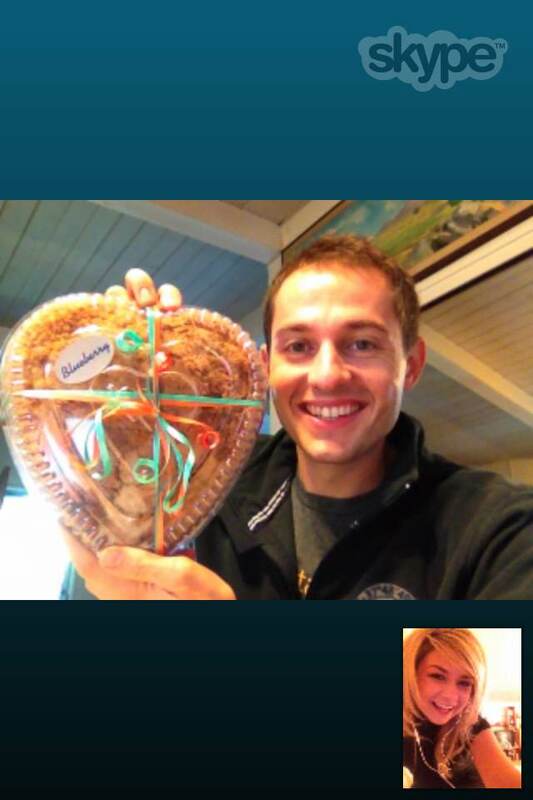 Love is in the air: Sebastian and his anniversary coffeecake, courtesy of Nadine and Hobee’s special delivery. 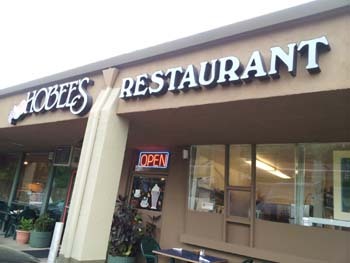 Sunday just got a little sunnier: Starting September 1st, both Hobee’s Palo Alto and Hobee’s Sunnyvale began staying open after lunch until 9:00 PM! 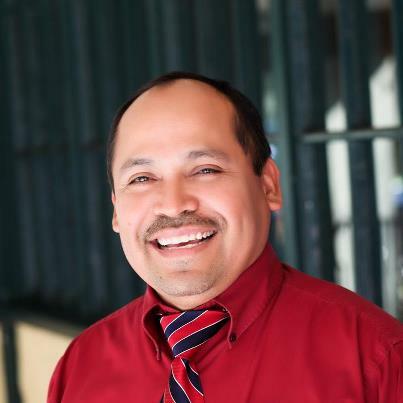 Previously, our employees at both locations had noticed a large number of customers tugging on our locked doors on Sunday afternoons. Now, our fans can stay longer, have a late lunch or savor Sunday supper. The new night got off to a rousing start in September, when we added a special Sunday edition of Kids Eat Free. We were incredibly honored to once again receive the Best Breakfast award from readers The Mountain View Voice. This was our Hobee’s Mountain View’s 21st straight year on top. We never take these kudos for granted and work hard to secure your vote each and every year. Thanks for voting for us! Why only 21 wins? The poll didn’t start until 1991, when the restaurant was already 18 years old! 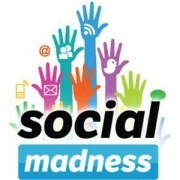 For the second straight year, Hobee’s went deep into the Social Madness contest sponsored by The Silicon Valley Business Journal. All of your Likes, Comments and Retweets on Facebook, Twitter, LinkedIn and Google+ took us to the semi-final round, where we fought valiantly against an inspired Willow Street Wood-Fired Pizza team. (Willow Street ended up going all the way to the national competition.) The nice consolation prize we received was lots of increased social media buzz. Thanks for your support! 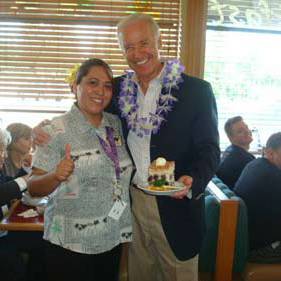 Sunnyvale Manager Janet Enciso gave Vice President Joe Biden a warm “aloha” to Hobee’s. 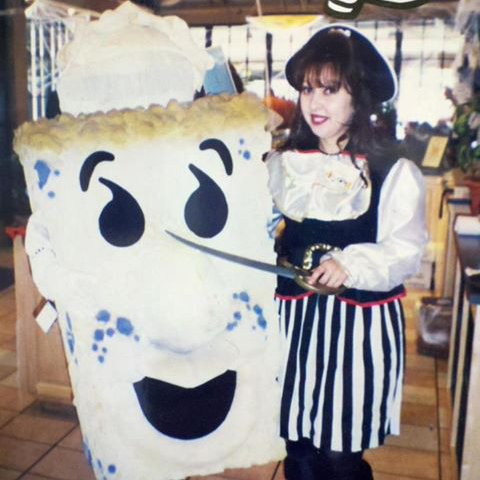 All of us at Hobee’s were saddened to learn that former employee Tina Favaloro had died. Tina passed away in April in Saratoga in the company of her loving family. She had battled cancer since last spring. Tina worked at Hobee’s Pruneyard as a server and manager for over a dozen years. She was a seasoned restaurant pro and performed her duties with confidence and an ever-present smile. Tina loved her customers and always took extra time with her regulars. Her hearty laugh could often be heard echoing through the restaurant. She was a favorite of co-workers who found her warm spirit to be inspiring and infectious. A few weeks ago before her death, we presented Tina with our annual Hobee’s Hero Award in recognition of her strength in the face of adversity. In May, her family, friends, co-workers and even some regular Hobee’s customers gathered to celebrate her life. All of us at Hobee’s will miss her dearly. We send out our heartfelt thoughts and prayers to her daughter, Gianna, and the rest of her family. Tina was always cheerful and upbeat. She loved Hobee’s and her regulars. Corn tortillas with chicken breast, mushrooms. Jack and Cheddar, brown rice pilaf topped with salsa, guac and sour cream. In addition, we offer several gluten-friendly items which are gluten-friendly but have been prepared along side other items in the kitchen. These items include vegetable soups (other than veggie pasta), salad dressings and turkey burgers. Felipe Zarate from Hobee’s Pruneyard won his fourth Outstanding GM title.